RealTime Gaming has come up with their latest game, right in time for the holidays. It sports an Halloween theme. 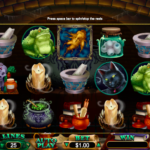 Witch’s Brew is a great game that has 5 reels and 25 pay lines. It is a scary slot game and has all the visuals to support it! The game is set in a brick basement where the witch hides. The toad is one of the highest paying symbols in this game. The other symbols you will see here are candles, cauldrons, mortar and pestles, eyeballs, and a grinning black cat. The witch’s dragon fang pendant is the wild in this game. It can replace all the other symbols in the except the scatters. Seeing them on an active pay line can mean a huge payoff for you! Though this slot can be played in the mobile, it does not work very well there. In this 5×3 reel grid, RTG has made sure that the game is simple to play and fun as well. Since the minimum bet is only 0.01, almost everybody can play this slot and have fun. The game offers many opportunities for earning bonuses and prizes along the way. Any winning combination with a wild will double your win. In case 3 matching wilds show up on the second, third, and the fourth reel while you are trying to get a 5-of-a-kind, the reels re-spin with the wilds set in the same place. 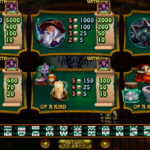 The Goblin Blood scatter give out individual prizes whenever they appear on the reel along with activating the bonus games. In the free spins round, with 3, 4, and 5 scatters, the player will win 10, 25, and 125 spins respectively. This kind of generous spins for free is rare! 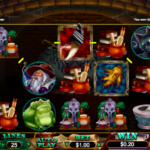 This is a fantastic Halloween-themed game with excellent spins features and bonuses. It is also available for US players. For another great and engaging game you should consider playing Snowmania by RealTime Gaming.